The Westland Lynx is a British multi-purpose military helicopter designed and built by Westland Helicopters at its factory in Yeovil. Originally intended as a utility craft for both civil and naval usage, military interest led to the development of both battlefield and naval variants, which went into operational usage in 1977 and were later adopted by the armed forces of over a dozen nations, where it primarily serves in the battlefield utility, anti-armour, search and rescue and anti-submarine warfare roles. In 1984 a modified Lynx broke the airspeed record for helicopters, which still stands today. The helicopter is now produced and marketed by AgustaWestland. The Lynx HAS.2 / HAS.2(FN) is the subject of this kit. It was the initial production version for the Royal Navy (HAS.2) and the French Navy (HAS.2(FN)). When it is used in the anti-submarine role, it is equipped with two torpedoes or depth charges and a dipping sonar. For anti-surface warfare, it is equipped with either four Sea Skua missiles (Royal Navy) or four AS.12 missiles (French Navy). This helo was superseded by the HAS.3 with several variants including upgraded avionics and the BERP rotor blades. 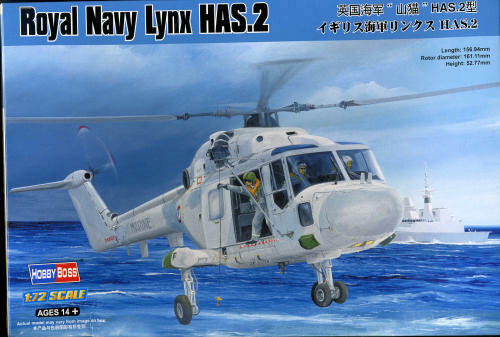 Previous to this Hobby Boss release, there have been two other Lynx kits in 1/72 scale. 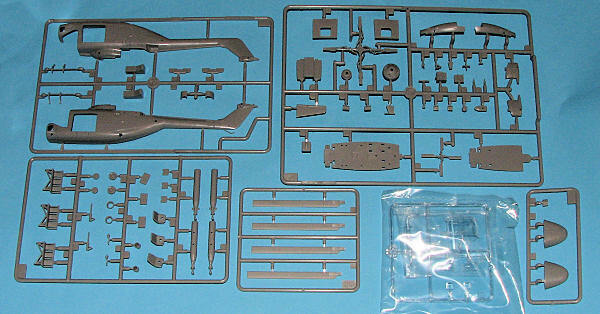 First was the Matchbox kit and while it is a fairly nice and simple kit, it is one of the prototypes and so the shape of the nose, among other things, isn't the same as production helicopters. 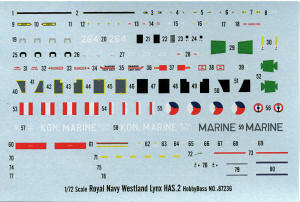 The next one was the Airfix kit, released shortly after the type had entered service, so it got all the shapes right. It is a very nice kit in its own right and your editor has built a couple of them and enjoyed both builds. As it was an early service version, it is lacking several of the later features, such as intake screens, that were soon added. This new Hobby Boss kit is well done and up to modern standards with engraved panel lines and rivets. Now on a helo, rivets are generally not of the flush variety, but we have to bow to the Chinese school of surface detailing on this one. The kit includes a full cockpit and cabin. As is typical of many helo kits, though not usually newer ones, there is no collective. There are three somewhat generic seats for pilot, co-pilot and crewman. These seats have separate seat pads, which should ease painting. The back has jump seats, which were installed when the helo was operating in the cargo/passenger mode. Interestingly, there are two center consoles and two instrument panels, one without any instruments as if for decals (which are not included). For SAR work, the Lynx has a hoist which is on a pedestal and moved inboard when not in use. This is not included in the kit. Both the floor and overhead are included, though both are smooth with no detail. There is no sidewall detail. The rotor-head is adequately done with good detail. Modern helos don't usually have a bunch of extra bits and pieces like one sees on the older helicopter rotor heads. The kit has a separate nose in order to do different variants and this is handy for adding weight. None is indicated in the instructions, but a wise modeler will install some anyway. There are two small antennas for the nose. The small wheel fairings are well molded and quite smooth. This is a bit incorrect as the outer 'cones' are actually canvas and appear quite wrinkled. The kit includes a pair of intake screens, which is pretty well standard equipment on helos nowadays. Two torpedoes and their mounts are included for attachment to the sides of the fuselage. The kit also has separate cabin doors, but these are obviously designed to be glued shut as there are no door tracks molded on the fuselage or provided as separate pa rts. The Airfix kit provides these bits so you can have the doors open. Instructions are typical Hobby Boss. They are well drawn and show any items that will need to be opened to attach things (like antennas). No interior color information is provided at all in the construction diagrams, and I do wish Hobby Boss would get on the stick and supply that. Now here is the kicker. The box says Royal Navy Lynx so you'd think there would be a British markings option. Wrong! You get markings for a Dutch Navy Lynx in extra dark sea grey over sky (the guide shows light grey and unless that has changed in the last few years, is wrong) and a French Lynx in two shades of grey. Painting info for the torpedoes is shown as well as for the Sea Skua missiles that are not included in the kit. Decals are well printed and should provide no problems. I have to honestly say that I'm a bit disappointed in this kit. First of all for misleading me to thinking I'd get British markings (though in honesty, if I had seen the kit prior to buying [I ordered it sight unseen] I'd have spotted that glitch), and secondly for not providing that much of an improvement over the older Airfix kit. I appreciate the more modern molding, but really, the only improvement is the inclusion of the engine intake screens. Weigh that against the ability to have the cabin doors open and unless you really have to have engraved panel lines, this one really isn't that much better than a nearly 30 year old Airfix kit. While it is a nice kit in its own right, when comparing it to what is available at probably half the price, I'd have trouble recommending it. Having said all that, I'll still build it as I bought it to stuff full of Pavla resin upgrade parts. I'll have to find something to use for the door slides, though. Late note: It has been pointed out to me that there is another kit by Fujimi that is even more up to date than the Airfix kit (which apparently has early smaller lower windows and a smaller engine compartment cover). I've not seen this kit so can't really make a comparison. Thanks to your editor and 'shop credit' at CRM in St. Louis.